“All you did by bringing those bankers in there was send a telegraph wire out to InBev that you’re ready to be taken over,” company architect August Busch III snapped to Anheuser executives during a 2007 quail-hunting trip in Florida. Two years ago, InBev bought Anheuser-Busch in a blockbuster $52 billion deal, putting an American icon into the hands of the Belgian-Brazilian beer giant. 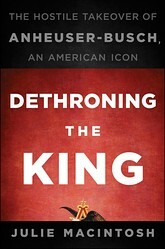 With her soon-to-be-released book, “Dethroning the King,” former Financial Times reporter Julie MacIntosh seeks to get business junkies and beer guzzlers to take a fresh look at the takeover drama that unfolded in the summer of 2008. MacIntosh posits that the Budweiser maker’s fate was sealed years earlier when it stood on the sidelines while other brewers went on buying sprees outside the U.S. The aversion to risk largely came from the hard-charging, cantankerous boss who also deserved the most credit for building the company into a juggernaut: August Busch III.